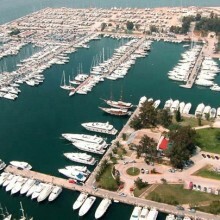 “Aktor Concessions SA” has been nominated as the preferred bidder for the granting of the right to use and exploit the marina of Alimos for a period of 40 years, through an e-Auction procedure that the Hellenic Republic Asset Development Fund incorporated for the first time in a concession tender. In the coming months, a large drone will check emissions from ships in Danish waters to make sure they comply with the sulphur limit. The drone is provided by the European Maritime Safety Agency, and is to be used as a means of preventing ship pollution. Executives from Cruise Lines International Association (CLIA) travelled to Santorini last week to meet with key stakeholders on the island, to further move forward plans to ensure a sustainable future for the cruise industry as the summer peak season approaches. The sale and transfer of the 100% stake of EESSTY SA (ROSCO) to TRAINOSE SA, the subsidiary of Ferrovie Dello Stato Italiane S.p.A., for a total consideration of €22 million was completed today.